I was a little nervous as I approached the table, but the third-graders’ excitement was contagious. I couldn’t pass up the opportunity to experiment alongside them. Mrs. Peach smiled and coached me on how to successfully pull the tablecloth out from under the dishes (and the water contained within those dishes). The kids chanted, “You can dooo it! You can dooo it!” It brings a smile to my face as I recall this moment. Thanks to all of the support and guidance I received, my initial attempt was successful. The students celebrated and then prompted me to try it again with an added challenge – more dishes and more water. I did not succeed at this second attempt, but Mrs. Peach didn’t mind that I spilled the water all over her classroom floor. In fact, she pointed out how the mess I made was evidence that scientists were at work! What a powerful message she sent about every experience being an opportunity to learn. Mrs. Peach is developing a culture of risk-takers and thinkers who know what it means to have a growth mindset. Proud Michigan Educators value these skills and dispositions for their learners and intentionally cultivate them through their words and actions. Creating a culture like this does not happen overnight. It requires living out a mission that focuses on success for all learners and capitalizes on the collective wisdom of the people around us. Ganiard Elementary’s teachers have developed their collective capacity and have chosen to focus not on the differences between their school and others, but on the variance in student performance they discovered within their own building. They used this discovery as an opportunity to work together, taking on responsibility for ensuring the learning of every student. I didn’t know the story of Ganiard Elementary, in Mt. Pleasant, MI, when I arrived there in early October, but I immediately felt welcomed by every person with whom I interacted. Shannon Recker was gracious enough to visit with me during her planning time (a sacrifice that speaks to this kindergarten teacher’s selflessness) to share her experience as a Proud Michigan Educator. Her warm, invitational disposition made me wish I could spend the entire day with her. 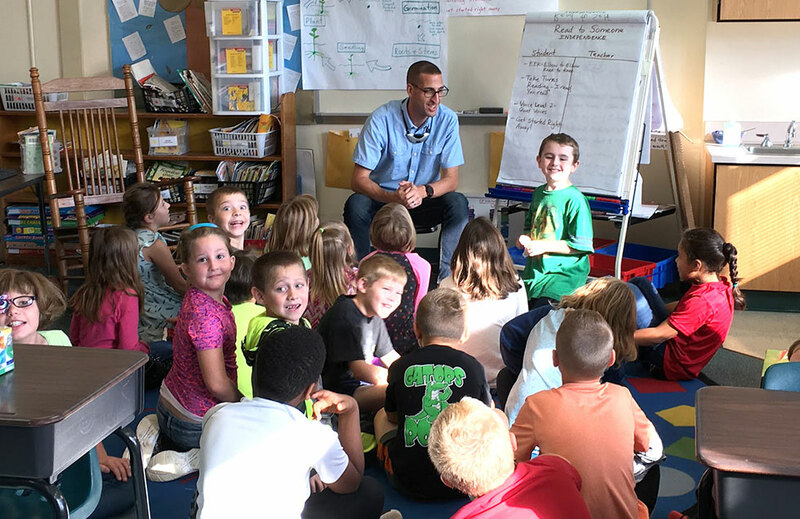 After Mrs. Recker had introduced me to Mrs. Peach and her budding scientists, she took me to meet Ryan Giegling and his class (pictured above), who were gathered together exploring their identities as readers by discussing ways readers think and act. These second-graders were proud to be readers, excited to share that they knew how to choose books just right for them. They explained how this helps them continue to grow as readers. The exuberance displayed from Mr. G.’s class sent a clear message: Learning is a joyful experience that we get to share with each other. Learning is joyful. And complex. So what do we do when our students haven’t learned something even though we taught it and they even seemed to enjoy it? Beth Conway and Erica Patera shared more with me about the journey that the Gators have been on to ensure that each and every student is met where they are in their learning and are guided to success. Data is used to inform decisions for their Multi-Tiered System of Support that becomes actionable during SWAMP (Students Working And Making Progress) time. They also noted the out-of-school time that is made available to students to provide additional support to learners who might need it. Beth’s and Erica’s sense of shared ownership and commitment to their school community was evident throughout our conversation. There are a moral purpose and sense of responsibility that drives thes teachers. Having a shared definition of quality is important because it becomes part of the culture. A shared definition of quality also enlists all members of the culture, not just a few, to take an active part in the effort. Importantly, it also empowers people by sending them the message that they are of value and their contributions are essential. As educational leadership researcher and expert Michael Fullan notes: “Deep and sustained reform depends on many of us, not just on the few who are destined to be extraordinary” (2001, p.2). Culture is built through shared experiences and language. Structuring the culture of a school such that the quality is the focus leads to increased achievement. Mr. G was able to convey a very clear focus that he and his colleagues share: helping every learner grow and achieve. Teacher teams collaborate weekly in hour-long PLCs in addition to six half-days when they are able to continue their learning together. They are focused on developing a shared understanding of the essential learning and outcomes desired for students. They ensure that their resources are aligned and that their instructional practices support learning. They partake in lesson studies and examine data from common assessments to determine interventions for students in need of additional support. These practitioners are open to growing and changing because they understand that the more we learn, the better we become for our learners. By developing their collective capacity, these teachers are getting results that are affirmed by a multitude of qualitative data and confirmed by quantitative data from tools such as NWEA (Northwest Evaluation Association) MAP (Measures of Academic Progress) tests. The focused, sustained, collaborative work these teachers engage in also speaks to the leadership of their principal, Marcy Stout. In fact, as smoothly as the Ganiard Gators operated during the morning I visited, I would not have known that Ms. Stout was up the road at Central Michigan University taking part in a panel presentation to support the learning of CMU’s future teachers. Ms. Stout’s supportive leadership style has fostered a sense of shared leadership. Learning and leading together is how we work smarter not harder. We find success when we are curious about what we can do every day to make sure more students are engaged more of the time. Being learners frees us from feeling like we have to have it all figured out and reminds us that “the more we learn, the more we realize we have to learn.” So where do we begin? If we follow the example of the Gators, we begin with a shared commitment to getting better every day for every learner.